Firs Zhuravlev was born in Saratov. Painting studied at the St. Petersburg Academy of arts, where he received a gold medal. His family painting — home painting; he is known for several paintings, the plot of which is taken from merchant life. "The merchant's Wake" — a multi-figure painting, full of subtle observation (1876), "the Blessing of the bride" — the scene of almost dramatic content, with great artistic merit (1878), also from merchant life. Zhuravlev wrote separate figures, right out of reality, for example, "Waiter". Also wrote portraits (such as father John of Kronstadt). Figure Zhuravleva right, painting subtle and the colours are true. 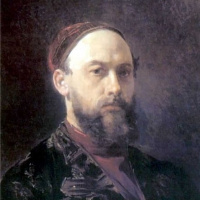 Firs Sergeyevich Zhuravlev was born in Saratov on 10 December 1836 in a family of commoners. His father was a tailor. The parents wanted the son continued the father's business and up to 19 years of age, the future artist studied the tailor's craft. In 1861 Zhuravlev is on the academic exhibition the painting "Dying father". One of the plots, popular in the early 1860s, was dedicated to the poor and unsettled life of the creative person – artist, musician, poet. Zhuravlev is one of the first turned to this subject, which had its development throughout the second half of the 19th century. In 1860-1870-ies the artist has exhibited his work at academic fairs, exhibitions society for the Encouragement of Arts. As before, he remained faithful to genre and the chosen theme of "humiliated and insulted". В1876 year Zhuravlev presented his programmatic work "the Merchant's Wake". Painting "Before the crown" and "the Merchant's Wake" marked a higher stage in the creative biography Zhuravleva. There is a hidden and a new artistic sense. In the paintings there is a depth of penetration into the problems of human life. In the period from 1880 to 1890, the artist painted portraits. Among them is the artist's self-portrait in which he appears before the public in a yarmulke, shirt and coat. St. Petersburg meeting of artists (1863-1864 Club artists.